AUSTIN, TX, Aug 6, 2014 - (ACN Newswire) - Averna, an industry-leading developer of test solutions and services for communications and electronics device-makers worldwide, has been honored with the title of 2014 Alliance Partner of the Year for the Americas. The award was announced on August 4 in Austin, Texas, during NIWeek, the annual global conference on graphical system design. As an NI Platinum Alliance Partner, Averna works closely with NI sales, marketing, R&D and technical support organizations to choose and integrate the best products to ensure satisfaction of mutual customers. "We are delighted with National Instruments Partner of the Year Award because it recognizes the tremendous effort Averna makes to deliver innovative solutions for our clients, and NI's leading test platforms are an important part of our success," said Benoit Richard, Vice-President of Innovation, Strategy & Marketing for Averna. "Our clients will continue to benefit from the unbeatable combination of NI technology and Averna test and integration expertise that solve their technical challenges, deliver substantial ROI and open doors to new market opportunities." "National Instruments is pleased to recognize Averna as the Alliance Partner of the Year for the Americas. This award showcases Averna's outstanding performance and ability to provide industry-leading solutions for today's enterprises," said John Graff, VP of Sales and Marketing for Americas, National Instruments. 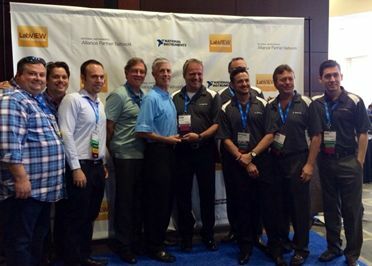 Click to Tweet(http://ctt.ec/ctEhI): From @Avernatech: National Instruments (@NIGlobal) Names Averna 2014 Partner of the Year for the Americas #NIWeek. Averna is a premier manufacturing solution provider for communications and electronics device-makers worldwide, helping them deliver a better end-user customer experience. Key Averna clients in the communications, aerospace, defense, automotive, consumer electronics, and medical device industries use Proligent, RF Test Instruments, and other test solutions to accelerate product development, reduce manufacturing costs, achieve superior quality throughout the lifecycle, and solve critical supply-chain issues. (c) Copyright 2014 Averna Technologies Inc. All rights reserved. Information subject to change without notice. Averna and Proligent are trademarks of Averna. National Instruments, NI, NIWeek and ni.com are trademarks of National Instruments. Other product and company names listed are trademarks or trade names of their respective companies. A National Instruments Alliance Partner is a business entity independent from National Instruments and has no agency, partnership or joint-venture relationship with National Instruments.